The first Space-Based Space Surveillance (SBSS) satellite will launch from Vandenberg Air Force Base in California on Sept. 25, 2010. The satellite is designed to detect and monitor debris, spacecraft or other distant space objects. A new U.S.Air Force satellite built to track space junk and other spacecraft orbitingEarth is set to launch tomorrow (Sept. 25) from Vandenberg Air Force Base inCalifornia. 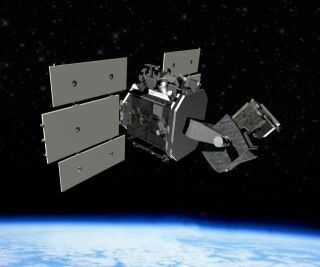 The Space-Based Space Surveillance satellite, called SBSS, is part of an evolvinggoal to dramatically improve awareness of space debris and other objects aroundour planet, Air Force officials said. The 2,277-pound(1,031 kilograms) SBSS satellite system will be launched into orbit on a Minotaur 4 rocket, designed by Virginia-based OrbitalSciences Corp. Liftoff is set for 9:41 p.m. PDT (12:41 a.m. Sept. 26? EDT, or0441 GMT). The satellite was originally scheduled to launch in Oct. 2009 but was delayed dueto technical concerns with its rocket launch vehicle. ? There areabout 500,000 known pieces of space junk orbiting around our planet. Of those,about 21,000 objects are larger than 4 inches (10.1 cm) in diameter, and arebeing tracked by the Department of Defense as part of the Space SurveillanceNetwork. These are items such as spent rocket stages and broken satellites. Space junk ? even tiny pieces of it ? can bedangerous because they orbit the Earth at high speeds and pose risks for impactsand collisions. The SBSS satellite will provide data for the Air Force's Space Surveillance Network,which already keeps an eye on orbital debris. Aerospace juggernaut Boeing isresponsible for the overall SBSS program management. TheColorado-based Ball Aerospace & Technologies Corp. developed, designed,manufactured, integrated and tested the satellite, using the Boeing-builtonboard mission data processor. The overall cost of the SBSS program is about $858 million, Air Force officials said. The SBSS spacecraft will be equipped with a visible sensor mounted on anagile, two-axis gimbal.This device will give ground controllers the flexibility to quickly move thecamera between targets without needing to reposition the satellite itself orexpend additional fuel. "Withits gimbaled camera, reprogrammable onboard processor and open-ground-systemarchitecture, SBSS can respond quickly to today's changing mission requirementsand adapt to meet tomorrow's threats as well," said Craig Cooning, vicepresident and general manager of Boeing Space and Intelligence Systems. "Boeing looks forward to putting these advanced capabilities into actionfor the Air Force." The SBSSsatellite will collect data to be used in conjunction with observations fromground-based radars and telescopes, but with one clear advantage. As the AirForce's only space-based tracker, SBSS will not be limited by weather,atmosphere or time of day. "TheSBSS team is ready to go on Sept. 25,? said Todd Citron, director of the BoeingAdvanced Space and Intelligence Systems. ?We?ve thoroughly rehearsed all plansand procedures, the Satellite Operations Center has been configured for flightoperations, and the SBSS satellite and Minotaur launch vehicle are completingfinal preparations. We?re looking forward to putting this spacecraft into orbitso that it can perform its vital mission."